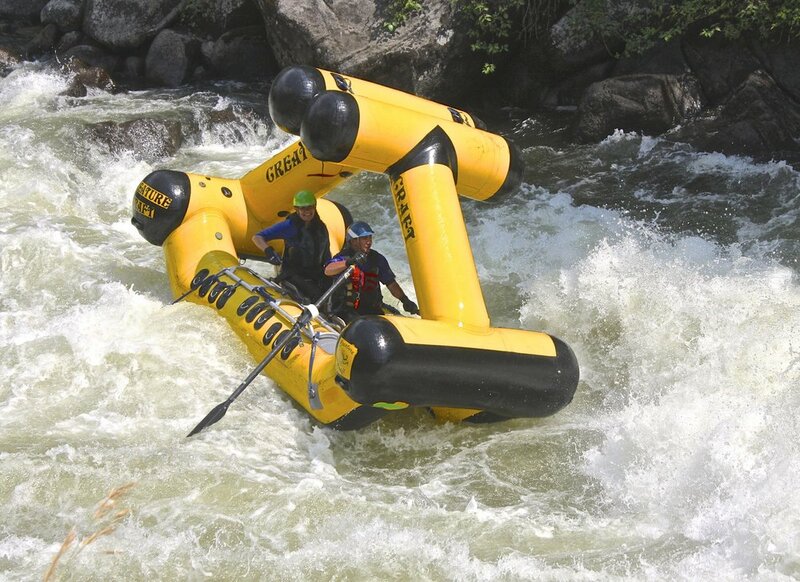 Creature Crafts are a patented new species of whitewater inflatable that open vast new possibilities for fun and safety on raging rivers. Traditionally, with whitewater rafting, flipping guarantees a swim for the crew, exposing them to the elements and potential injury. The key trait of all Creature Crafts is that they can be rolled back to an upright position while remaining seated in the boat. This is achieved with the aid of the patented roll cage design which limits the boat from settling upside down. The roll cage also helps protect the crew from rocks and other objects when the boat is on its side; though you must always be aware of your surroundings. Creature Craft was born from the desire to run big powerful whitewater. Although the inherent risk is always there, Darren wanted to diminish the risk involved. Let’s keep in mind what being on the water all about, fun. The challenges presented in whitewater are unique, yet transfer into our civilized lives in so many ways. Paddling or rowing a Creature Craft provides the ability to achieve whitewater pinnacles that were thought to be un-runnable. In some instances, the Creature Craft is the only way you can even consider putting on the water. If you’re just getting started or are an experienced river runner, the Creature Craft introduces a whole new style of running rivers. Big continuous whitewater abundant with hydraulics, steep drops, and gigantic waves become incredible playgrounds. The general idea remains the same. Go out, have fun, stay safe, and learn by challenging yourself in the process. Experienced river runners know how fun and nerve wracking certain rapids are by nature. Creature Crafts help to calm some of those nerves because unintentional swims are rare. So after the past decade of running some of the world’s most extreme rivers the Creature Craft Crew have even developed some tricks. “Doing tricks” is certainly possible in a Creature Craft. Back-flips, barrel rolls, endos, pirouettes, and huge life changing surfs are all waiting just downstream! Traditionally, with whitewater rafting, flipping guarantees a swim for the crew, exposing them to the elements and potential injury. The key trait of all Creature Crafts is, with proper technique, they can be rolled back to an upright position while remaining seated in the boat. In a Creature Craft, the potential for a swim is greatly reduced as the paddler/oarsman rides in a seat with a lapbelt. The roll cage design provides a protective enclosure even when upside-down. The roll concept is similar to that of a whitewater kayak. 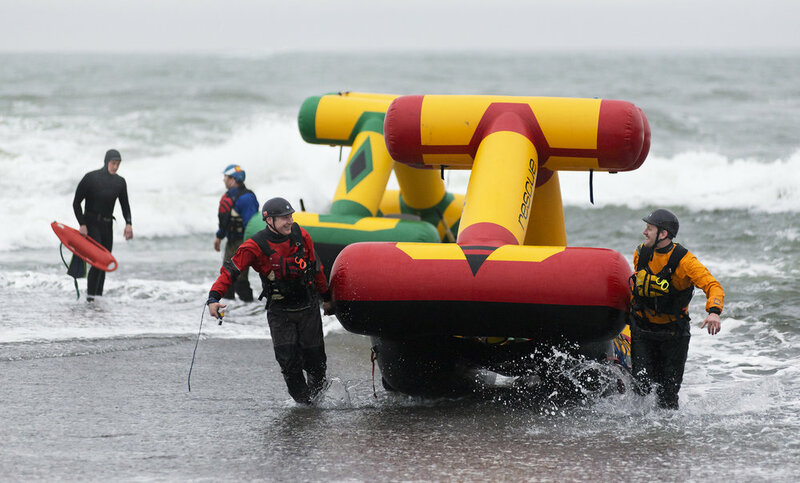 If the boat capsizes, there is the possibility to perform a roll while remaining inside the boat, often continuing down the river barely missing a beat. “Low Head Dam” operations are traditionally one of the most dangerous environments a swimmer, boater, or rescuer can face. With the use of a Rescue Craft, the catastrophic possibility of putting a rescuer into perfect terminal hydraulic is mitigated. This creates an effective safe alternative to putting rafts or other water craft into a low head dam. Every seat has a quick release system which allows a paddler to quickly unstrap if necessary. Nevertheless, like with whitewater kayaks, it is usually to the paddler’s advantage to remain inside the boat and roll it as soon as possible. All of creature craft products are designed and tested in beautiful Colorado. Our headquarters are located in Grand Junction but our reach is global. We may assemble the crafts in Colorado, however we are always looking for a new adventure. Get in contact with our team and we'd be happy to demo in your nearest body of water. Let us know where you are located and how many in the your party would like the demo.